Disposable razor and shaving foam. 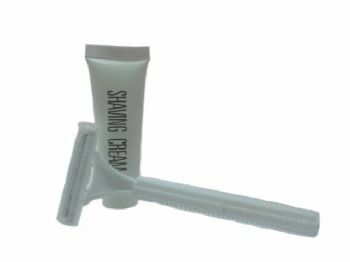 This little disposable single use razor and shaving foam offers your guests the away from home comforts they are used too. The shaver and the foam come together in a sealed and hygienic cellophane wrapper. The shaver is made from pure white plastic too match to any interior decoration or any other existing guest soaps, shampoo sets or brands. The saver has two fixed blades and comes with a removable blade protector which keeps the sharp blades away from accident skin contact whilst being stored.